Darglow is a long-standing supplier of the Danish Flex-O- Fold range, which represents the current state of the art in folding propellers. 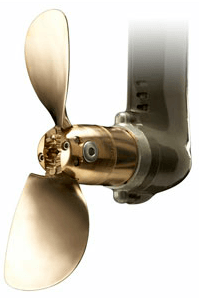 Due to greatly improved blade design, these modern propellers now offer thrust comparable to fixed propellers in forward and powerful thrust in reverse thanks to improved weight distribution, blade area and shape. Because of their low drag profile under sail, average sailing speeds can increase by as much as 15% compared to fixed 3 bladed propellers. Available in sizes from 12” to 22” diameter, Flex-O-Fold prop’s can efficiently absorb from 7 to 100hp. 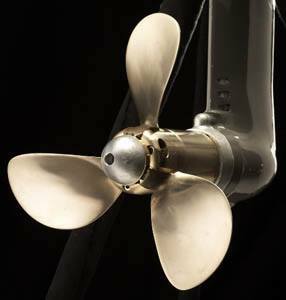 When it comes to propellers, Darglow can help and advise on the exact requirements to suit you own particular needs. 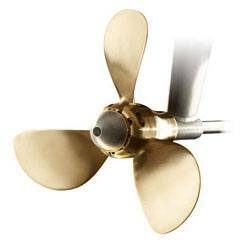 Flexofold low drag folding propellers are suitable for sailboats and multihull yachts. All Flex-O-Fold’s are delivered complete, including tools, Loctite and easy to follow installation instructions. Fits directly on existing shaft, without modifications. That depends on what sailing boat you have, the engine and not least – your priorities! A 2-blade propeller is more efficient than a 3-blade. Surprised? Well, most people are. Thus, a properly sized 2-blade will give you a higher speed at a given RPM in flat water than a properly sized 3-blade. The 2-blade is also lower in drag and cheaper. The blades are synchronised by patented, twin helical gears. Blade-stops are cushioned by strong polyurethane stops. Oversized components secure a reliable transmission. All parts are locked together by a special foolproof system. The pivot pins are secured by special, patented tapered lock bolts. This is the best Flex-O-Fold for most sailors, owing to the powerful thrust in forward and reverse. Sailors choose this model where there is a need for maximum thrust and least possible vibration. The zinc anode covers the gears providing its normal protective function. For the very lowest drag with excellent performance under power. A real winner!